When I was recently visiting New Hampshire, I had a taro bubble tea for the first time in ages. I forgot how much I loved them! Since returning to SF, I've been on a quest to find a good one. This time I headed to Little Garden, in Chinatown. It was pretty legit, with the menu in Chinese, and I was the only non-Asian in the entire place. I ordered it online through my phone, intending to just run in and grab it and go, but it wasn't ready yet when I arrived. The staff was incredible friendly, offering me a place to sit while I waited, even filling a water glass for me. They also randomly had free wifi, even though it was certainly a restaurant, not a cafe. I didn't try the food, but it did look good. Unfortunately, I didn't love my bubble tea. It wasn't as bad as the one from Out the Door, but my favorite may still just be from Quickly, although the taro smoothie from Miss Saigon was also memorable. This wasn't great. The decent: the taro flavor was good enough, it was creamy. The mediocre: I disliked the use of crushed ice rather than ice cubes, as it got sucked up too easily in the straw, getting confused with the boba. 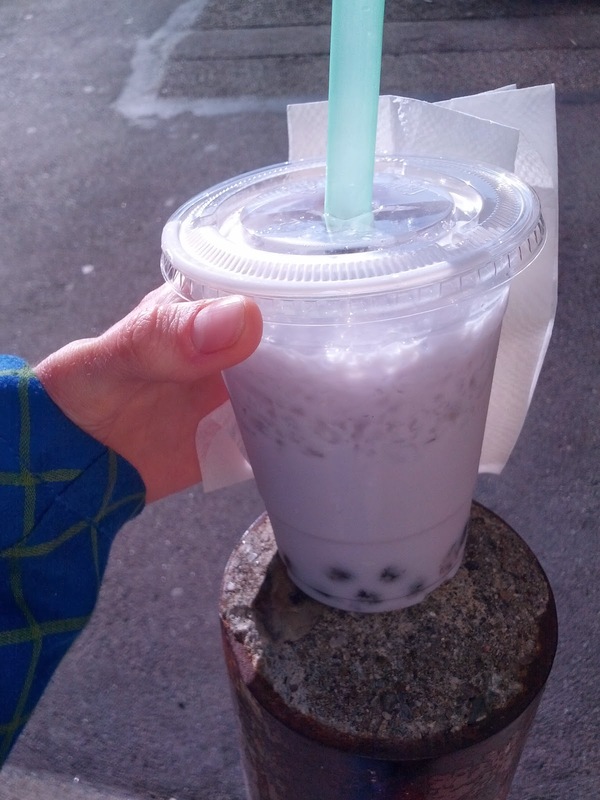 The bad: my real issue was the tapioca. It was way too soft. Not good at all. Price was higher than average, but it was a real restaurant, not just a bubble tea shop. I certainly wouldn't get again. Travelin' Tuesdays: Boston and New Hampshire! Monday: Reviews of chain restaurants, catering, or food trucks. Tuesday: Taco Tuesday, or other special Tuesday series. Wednesday: Full service restaurant reviews. Thursday: Reviews of bakeries or ice cream shops. Friday: Packaged snack foods or drinks. Sunday: Chocolate, or other candy. When I review restaurants, they are almost entirely located in the San Francisco Bay Area, since that is where I live, and I assume most of my friends who read this do as well. I never saw a point in reviewing places outside the region, since I didn't think they'd be valuable to any of my readers. There have been a few exceptions, like when I've been blown away by meals, like my lunch at Republic Cafe in Manchester, New Hampshire, or an entire series I did on my favorite place in my home town, Home Hill Inn. But I recently traveled to Boston, and had some absolutely extraordinary dining experiences. Some of the best meals of my year. I feel compelled to share them. I also had some of the worst. And, some fun airline food. For the next few Tuesdays, I will begin a new "Travelin' Tuesdays" series. We'll start with the snacks in the American Airlines Admiral's Club, and then move on to inflight dining: Main Cabin food aboard Virgin America, First Class food aboard American Airlines, and First Class on Virgin America. We'll visit classic east coast establishments like Legal Seafood and Lou's Restaurant, hit some high points like Clio (top meal of the year!) 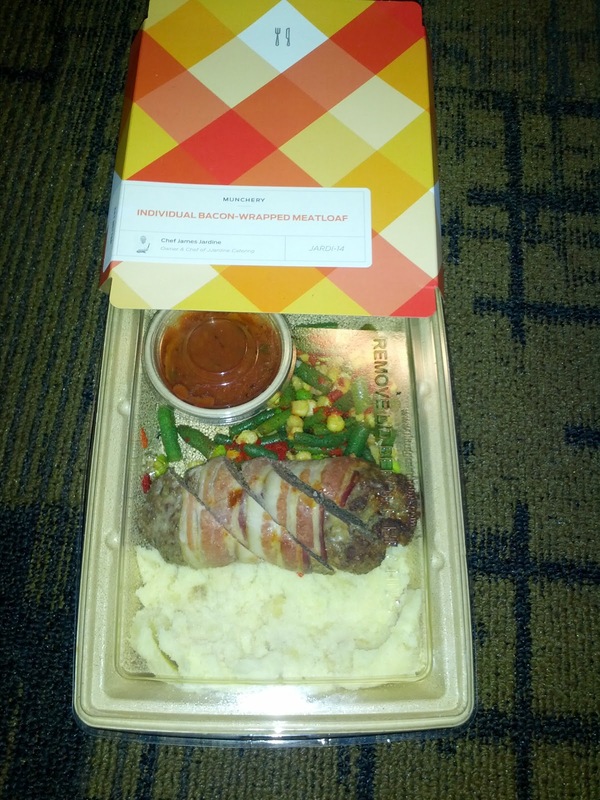 and O Ya in Boston, and some lows like The Flying Goose in New Hampshire, and conclude with delicious airline meals. And a few more fun ones along the way, like glazed cruller bread pudding with eggnog whipped cream at Lou's. So stay tuned dear readers, it is time to travel! You've heard me rave about a local meal delivery service, Munchery, before, so I'll spare you the overall details again. Check out my other Munchery reviews for the background. Munchery just continues to improve! A few things have changed since I last used Munchery. The first is the packaging, not only does it look better, but the trays are compostable, microwaveable, and oven safe now. And everything is made with recycled materials. The meal offerings have expanded, with kid's meals (smaller portions, more kid friendly items) in addition to the adult's meals they always offered. And for beverages, you can order beer, wine, cider, coffee beans, even fresh squeezed juices. And, they've brought on some great new chefs. Of course, there are a slew of other reasons to love the service as well, not just because the food is delicious and it is convenient, but the company is also socially responsible, donating a meal for every meal you order. And they use high quality ingredients, organic and sustainable. If you haven't checked it out already, I highly recommend, so perfect for weeknight easy meals, and so, so much better than standard delivery! If you use my invite link, you'll even get $20 off your first order. Crispy Snapper & Veggies. Kid's Meal. $6.50. "A children's portion of herb-breaded fresh snapper strips, served with steamed carrot and zucchini batons with a mild tartar sauce for dipping." Anyway, I was delighted to see that Munchery now offers kids's meals! Smaller portions, with more of a comfort foods slant. But who doesn't love real fish sticks? I took the chef's suggestion and reheated the sticks in a toaster oven, rotating every few minutes. I heated them longer than his suggested time, in order to really make them crispy. And ... it worked! They really did crisp up nicely. It was a bit hard to believe that they'd arrived already cooked and cold, and could transform so nicely. The outside was crispy, and slightly flavored with mild herbs. Inside was moist and flaky snapper. It wasn't dried out, which I had feared might happen in the reheating process. It wasn't fishy, which I had feared might happen since it wasn't "fresh". In fact, it really was just good! Quality fish, nice seasoning, and turns out, totally fine to reheat! The tartar sauce was unremarkable. As an adult, I think I wanted something with a bit more zing, some capers, something, but as a kid's meal, this makes sense. There was also lemon wedges to squeeze over it. The only disappointing part was the side of veggies. Just some carrot and summer squash sticks that had been steamed. They were limp, and didn't really liven back up when reheated. But overall, certainly a winner, and I'd order it again. I also thought the portion size was just right for me, and the price of only $6.50 was incredible. 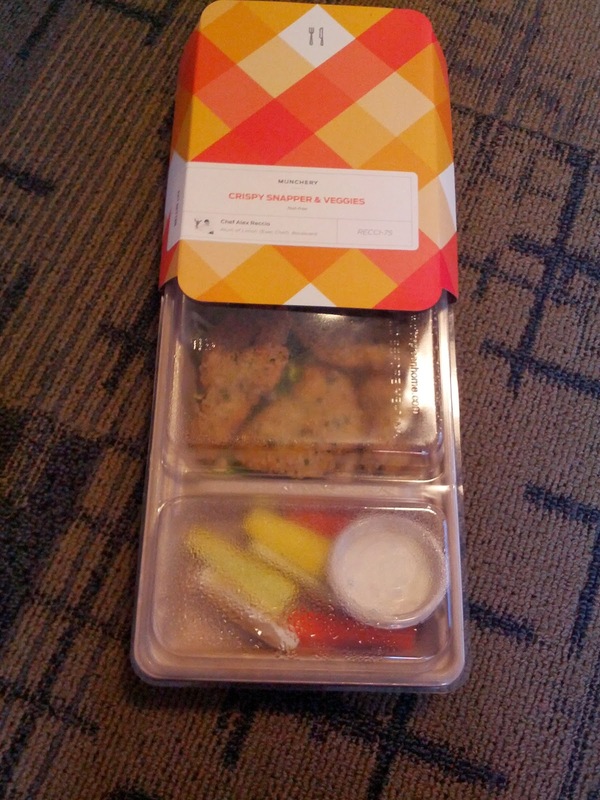 I'd love to see Munchery offer smaller sized "adult" meals too. I have no problem ordering a kid's meal, but if that does mean toned down flavors, I'd prefer just a smaller size of a meal designed for adults. Individual Bacon-Wrapped Meatloaf, Roasted Tomato Sauce, Yukon Gold Smashed Potato. $10.95. "Individual bacon-wrapped Angus beef meatloaf with roasted tomato sauce, edamame soy bean, corn and blue lake bean succotash, and Yukon gold smashed potatoes." I did not actually have this dish, but I snuck a few bites of the mashed potatoes. I was really impressed with how creamy they were! The person who was eating this dish liked the potatoes, but said he needed a sauce other than the tomato sauce to go with it. Large portions of everything for the price. This time she came back with chocolate from Milka, distributed throughout Europe. I was not familiar with the brand before, but it seems quite large. The internet tells me that the name is "mil" from the German word "Milch" and "ka" from "Kakao", or, milk and cocoa. Cute! First we tried the "Milka Triolade". 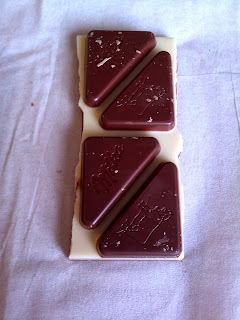 A layered bar, with a milk chocolate base, a white chocolate center layer, and dark chocolate triangles, hence the name "triolade", or, "triangle". 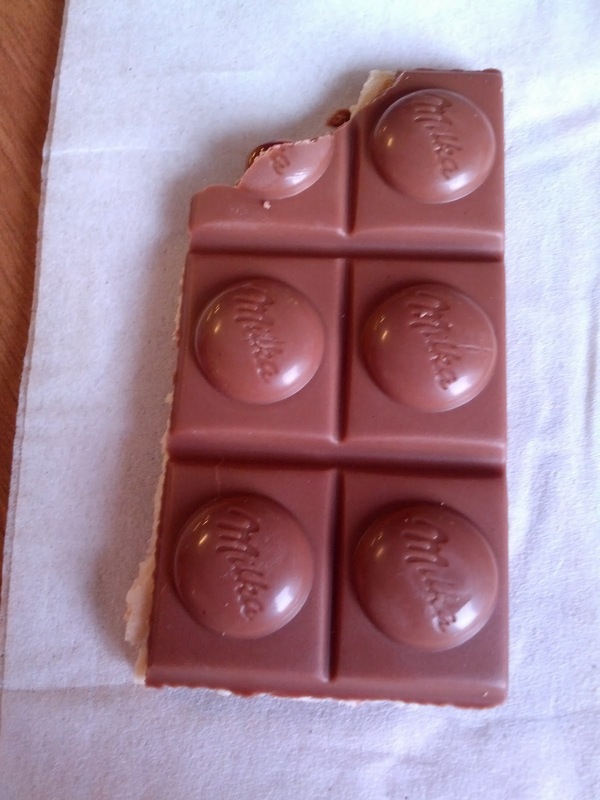 This was a decent piece of chocolate. Each layer had its unique properties. Standard milk chocolate base, sweet creamy white chocolate on top, both of equal size and thickness. And then a smaller, triangle shaped, dark chocolate. The dark chocolate was the most remarkable, really a smooth, deep flavor. Altogether, quite enjoyable, and the overall result was certainly better than any individual layer. Milka Toffee Ganznuss, or "Toffee Wholenut". Next we went for the "Toffee Ganzuss", descried as "Alpine milk chocolate with a caramel creme filling with added whole hazelnuts"
This was a VERY sweet chocolate. The milk chocolate on both sides was incredibly smooth and creamy. Inside is a white filling, very sweet, I am guessing this is the "caramel creme"? Or at least the cream. Then there is additional gooey caramel, super flavorful and sweet. And, a whole hazelnuts in the center of each square. A wonderful combination of flavors, and textures, but very sweet. My favorite of the two bars we tried.